Biotech Connector at Nebraska Innovation Campus is the state's first wet-lab. Wet labs are specialized laboratories that offer water, direct ventilation and specialized piped utilities. They are often used to test chemicals, drugs and biological matter. The Biotech Connector, the state’s first wet-lab business incubator, is now open for business at Nebraska Innovation Campus. Companies already are using the newly completed 7,700-square-foot facility, according to Dan Duncan, NIC’s executive director. The Biotech Connector is a collaboration between NIC and the U.S. Department of Commerce Economic Development Administration, the Nebraska Department of Economic Development, Bio Nebraska, Invest Nebraska and the University of Nebraska–Lincoln. Panorama image from inside Nebraska's new Biotech Connector facility. Click to enlarge. The facility provides incubation and acceleration services to bioscience startups and high-growth biotech and research-based businesses. 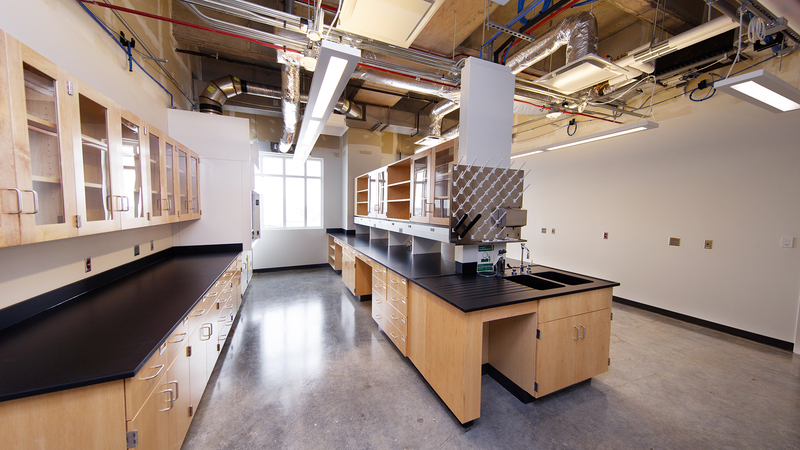 Housed on the fourth floor of the Food Innovation Center, the incubator offers wet-lab space to develop biotech commercial proof-of-concept prototypes in Nebraska. Wet labs are specialized laboratories that offer water, direct ventilation and specialized piped utilities. They are often used to test chemicals, drugs and biological matter. “The Biotech Connector empowers entrepreneurial scientists, mentors startup biotech firms and develops partnerships to launch biotech companies,” said Eric Zeece, manager of the Biotech Connector and innovation manager for Invest Nebraska. The Biotech Connector leases wet-lab space to companies or organizations with the goals of expanding the state’s biotechnology industry and creating high-paying jobs. The space offers bench space for lease, equipment, commercialization support, life-science mentors, assistance for qualified firms preparing non-dilutive grant applications and offers assistance for companies preparing for venture financing. Nebraska Innovation Campus is designed to create partnerships between the university and private sector businesses.